Всё! Никакой модульности, никаких кнопок сзади, и, конечно – «монобровь». Флагман серии G больше ничем не выделяется, он такой же как и все. Разбираемся! Hello everyone. The agenda is LG G7. Again a new smartphone, a new philosophy. Once again the Q-line has changed. The first smartphone Optimus G was released in 2012 after the legendary Nexus 4..
Smartphones were similar, but the Optimus did not find the popularity that the Google-phone got. The next G2 has already turned out cool and fast. It was a very cool smartphone for its time, By the way, LG thought of installing the power button and volume on the back, although the buttons did not stay there for a long time. But the G3 turned out to be a controversial device, because they put a QHD-display there … for that time was an unnecessary decision. The next G4 generally stood out with its design, LG tried to make a leather back. Looked great, and it also wore out "great." Perhaps it was a better device from G series, but they refused from leather in the next generation. Because she was constantly wearing out (I have already said this), and in the G5 they abandoned the volume buttons behind, leaving only the fingerprint scanner with the power button. G5 suddenly became modular. Modules were expensive, LG made them, ultimately the usefulness of these structures has not been disclosed. It not worked out. At G6, experiments were completed and we saw just a solid smartphone with a large screen, watertightness and protection against military standard strikes. With normal buttons, large screen, plus it was the first smartphone among the flagship with a ratio of 18 to 9. 2018 year. LG announced the G7, adding to the name ThinQ, which first appeared back in the days of MWC 2018 together with the smartphone V30S..
And in all smart devices from LG. What does it mean? "Thinking of you" Well, oh, these Koreans ... Okay. Well, let's see what LG brought to us this time. 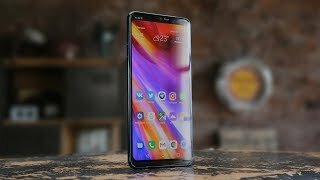 An exciting topic, so we'll end it right away: yes, there is a "notch" here; yes, it can be hidden with strong rounding or with weak ones, as you like, you can put something in color; and yes, the bottom of the frame is thick, it would be better for the engineers to shift the screen below .. let's go further. In the design, the predecessor G6 is guessed — toughened glass and metal frame. It also got protection against water according to IP68 and protection against impact according to the military standard MIL-STD-810G. In 2017, we tested that already, to G6 in this regard there no questions at all — really sturdy phone. Naturally, you should not abuse the blow against the ground. The front panel took a large 6.1-inch screen with a resolution of 3120 by 1440 pixels and a density of 563 ppi.. The aspect ratio 19.5 to 9. Next. The display is made using MLCD + technology, that is IPS. Why IPS, and is it bad? No, it's rather good. Pixel 2 XL has one of the worst and “lottery” OLED displays among the flagships, and it was released by LG. The company with IPS has long been a good relationship, so the choice is understandable. Moreover, the screen has a maximum brightness of 1000 nits. this is the highest figure among the flagships “on paper”. In fact, do not say that the whole thousand is right, but that is much brighter than the same Pixel 2 XL, and for example, at the level of the iPhone X – fact. Naturally, there is full coverage of DCI-P3 color space. And no more over-lighting, maximum viewing angles and in general for such a matrix you can kiss a Korean engineer. There is also the Always-On mode, it is very flexible. There was an application of AI, because of which the ThinQ addition appeared in the title. The smartphone itself analyzes the environment, adjusts the colors of the display, there are different modes: Auto, Eco, Movie, Sports and Expert. There is nothing to say about this at all. Well, good, even an excellent display – but it's hard to feel a smart function. Two new buttons appeared on the case. Firstly — it's a power button, it moved from the scanner to the right side. and the second button (hello, Samsung!) — management of voice assistant. Clicking on enables Google Now. Вот вам и вся философия Optimus G – не осталось от неё и гроша. At the bottom Type-C with USB 3.1 and OTG support, they said that is fast, we busted it — slow, plus Jack 3.5 – cheers. Microphone (speaker) - only one. And this is the best music smartphone of 2018. At least that's what LG said. G7 uses its own body as a resonant chamber for doubling the bass and using Boombox dynamic. And it's all very cool - the speaker is really cool, but it's alone, it's not stereo. So how the hell it could be a music smartphone? In addition, there is a 32-bit Quad DAC Hi-Fi with support for DTS:X 3D Surround Sound 7.1 and codec aptX HD.. But. The speaker is one, there is no stereo effect. But the sound in the headphones is excellent, because of the built-in DAC. There is a dual camera at the back: each module is 16 megapixels with apertures f / 1.6 and f / 1.9. It is interesting that there is no double optical zoom, as it usually happens — dual camera is needed for a wide-angle picture. LG does not change traditions at least here. There are HDR10 and portrait mode. The second example of using artificial intelligence. It automatically detects the scene and objects, choosing the most optimal settings. In general, the camera as it seems to me is not much different from the G6, there is a small oversharpening, at night in general – ok. Perhaps the level of S8, but not Huawei P20 Pro and not Pixel.. The video records in 4K/30 fps, without optical stabilization (in the other modes with it). It is a pity that there are no 60 frames. The front eye of the camera is also wide-angle. Has a resolution of 8 megapixels and an aperture of f / 1.9. I praise the camera — not bad. And yes, there is a Face Unlock. But it works "not very fast" ... a mystery! Hardware, everything is serious. Snapdragon 845, 4 GB of RAM and 64 GB of built-in. In the version G7 + ThinQ 6 and 128 GB respectively. There is a slot for microSD, NFC, Bluetooth 5-th version and even FM. Works on Android 8.0 Oreo out of the box. It's true that there is nothing from stock Android, But the shell over the past couple of years has become much better. The battery in the G7 is quite small for such a display – 3000 mAh, but LG said that MLCD+ consumes 30% less energy. In fact – 4 hours of screen, well, until 8 pm it will be enough. Which, in principle, is already good. Smartphone supports wireless charging, Quick Charge 4.0 because of the processor, but comes with the Quick Charge 3.0 charger. It's strange. Perhaps you should try to buy a normal charger. There will be four colors on sale: Aurora Black, Moroccan Blue, Platinum Grey and Raspberry Rose. Official colors and prices in Russia are still unknown, since smartphone went on sale only in Korea... It will also be on sale in Russia very soon. Total: the best hardware, a good camera, protection from water and dust, shock protection, built-in Hi-FI DAC,.